Each issue of Luxe Interiors + Design magazine is the uncompromised source for those with a passion for creating beautiful surroundings and living well. It is the influential go-to-guide that leads readers to discover and acquire local and national resources for design, decorating, architecture and renovation. Curated for the affluent, sophisticated homeowner, Luxe Interiors + Design is the only luxury publication that offers access to the local design and architecture scene, while also covering national design news and trends. The Luxe Interiors + Design network and its influence extends nationally into local markets reaching in-market readers. 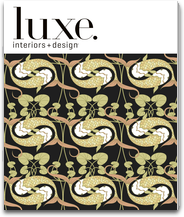 This app includes downloadable versions of the most recent issues of Luxe Interiors + Design, available via in-app purchase. Readers can also subscribe to get first access to all of the newest issues as they're released. Print subscribers can read the digital version for the duration of their print subscription at no additional cost. Digital subscriptions are optional, and last for one year from the date of purchase and cost $14.99/year, and are automatically renewed until canceled. Your credit card will automatically be charged for another subscription period (another year for annual subscribers) unless you change your subscription preferences in your account settings.